To use Hydra in IDEA you need to download the Triplequote Hydra plugin and activate your license (if you haven't already). Upgrade or download the latest IntelliJ IDEA (minimum version 2018.3). 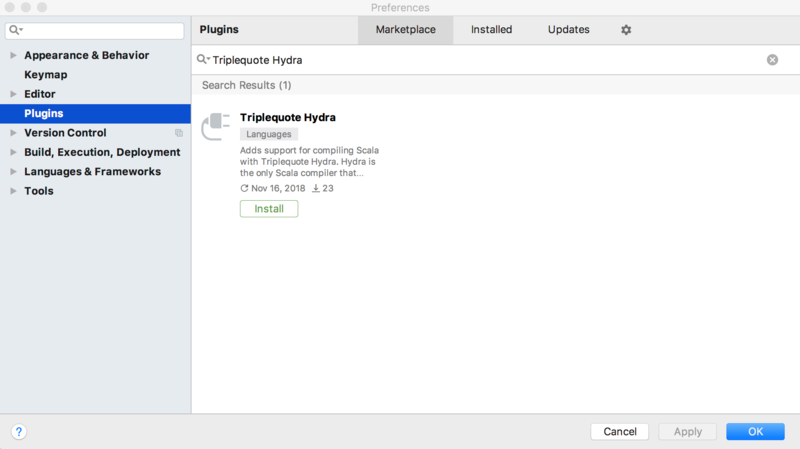 Install the Triplequote Hydra plugin via "Preferences > Plugins", click on the "Markeplace" tab and search for "Triplequote Hydra". Restart IDEA when the installation is completed. Open the "Hydra Compiler" settings by navigating to "Preferences > Build, Execution, Deployment" > "Compiler" > "Scala Compiler" > "Hydra Compiler". If you have already activated your Hydra license, at the top of the Hydra settings panel you will see a green tick and the license validity period. Otherwise, if no active license is detected, you will need to activate your license. You can come back at any time to the Hydra compiler settings to inspect the status of your license. Click on the "Enter license key" button, paste the license key and click "OK". The license will automatically activate itself in a matter of seconds. Once the license is active, the Hydra settings panel will update and display the license validity period. Congratulations, you have successfully installed Hydra! Hydra is automatically enabled if the Scala version set for the project is supported (Hydra supports all stable releases of Scala since Scala 2.11.8). 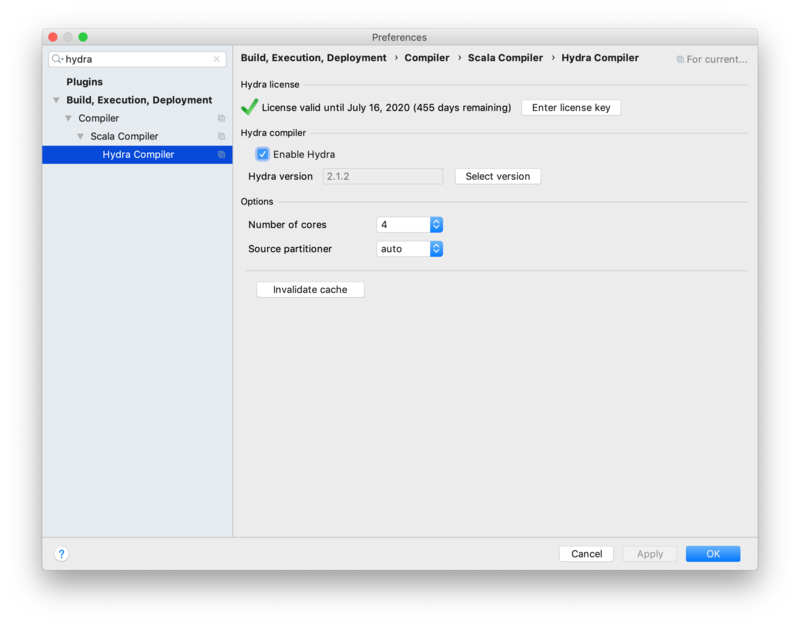 To check if Hydra is enabled on a project simply open the "Hydra Compiler" settings by navigating to "Preferences > Build, Execution, Deployment" > "Compiler" > "Scala Compiler" > "Hydra Compiler". If Hydra is not enabled, check the Scala version is supported, and make sure to update the set Hydra version to the latest release. After dong so, tick "Enable Hydra" and proceed to compile the project. You need an active Hydra license for compilation to succeed. Read License activation for how to. Keep in mind that the number of Hydra workers used may vary depending on your machine's hardware, what type of Hydra license is in use, and the number of compiled sources. Contact us at support@triplequote.com if you encounter any problems, or if you need assistance.